I headed off in pursuit of a Bernina (sewing machine) advertised on Craigslist in an attempt to replace my long lost love. It was just one more small step in the whole distressing sewing machine saga, expletives expunged. The navigator on my phone has been not so great lately, and the quest took longer than I expected (though I would have gone further for my precious). The advertisement said McDonough, but the first road off the interstate kept on and on east before I reached my first turn. It was further than the hour’s drive I anticipated. The landscape was inviting and it reminded me that if my life could be down here, I could have twice the home and land with a vegetable garden for much less money. I got to the caverns of the Misty Mountains. It was actually a beautiful house and the machine was not my precious. I was newish to my search and didn’t know the Bernina models well. To complicate things Bernina repeats model numbers. I knew before I went that this was not the exact machine I was looking for, but I didn’t know if it was close enough to do for a while. The seller and I both wanted the sale to make and we were both disappointed that it didn’t. As I left through her garage, there was the pile of garage sale left overs. You know, the pile, the one that’s about to be donated to the closest cause. I asked about the wooden bookcase in the middle of it. It had been painted poorly. The entire bottom of one shelf was bare wood, but the other bottoms were painted. It needed re-painting, but it was solid pine construction and in sound structural condition. She asked more than I wanted to pay (the all time biggest cause of garage sale left overs). But, occasionally I will buy something that only has the potential to earn back gas money, because, hey, overhead costs, whether you cover it or not. I think we were both disappointed on the bookcase as well, but we did make that deal. The bookcase didn’t fit in the car, but somehow I managed to get it in anyway and avoided being licked to death by her dog at the same time. When I bought it, I had a few ideas and knew that it would be a great for displaying items in our booth at Queen . I rose above my navigator and stopped at every thrift store I could find on the way home, another attempt to get the most from my gas money and potentially find new places to hunt for treasures. Still, at the end of a long day, what I had to show for my time was one bookcase that I almost didn’t buy. The bookcase wintered in storage because we don’t have a good place to paint in the apartment or the temperatures that the paint requires to set properly, but with this recent little burst of spring Russ has given it new life. He painted it and put some of his unique art on it. He has made a beautiful save. Russ does what we call doodling, for lack of a better word. And his fresh paint and doodling has made all the difference. There is this thing called the 80/20 rule that applies to our bookshelf. There are a lot of 80/20 rules actually. Most derive in some way from the Pareto Principle, 80% of the effects come from 20% of causes. Productivity coaches often use some version of the principle to teach clients to focus on the most productive activities so they can boost business to the place where the mundane 80% time sink can be hired out. In our case the 80% is in the treasure hunt and it could never be hired out. And yes, that’s a great big limiting factor for the business. What I do is often as much a buying service as anything else, one that requires a cleaning service as well. 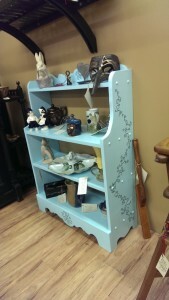 This bookcase is a great example good teamwork though and I hope a harbinger of things to come. I sometimes call what Russ did with his 20% rebirth on this bookshelf as his Rusty magic, but I doubt that name is good for public consumption. We need a better name for his art style and we’ll give a set of his handmade notecards to the first person who sends us the name we choose. 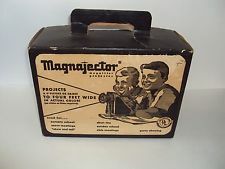 I first saw a Magnajector as a child. It is a branded opaque projector, a black plastic device with an angled mirror to reflect an image and a lens to amplify it. It is a kindred spirit. Early ones were made of bakelite and the earliest opaque projectors, those before electricity were illuminated by lime light. My mother used hers to project small printed things like photographs or print type onto a surface like a wall for some of her art projects. This was before people had such excellent access to countless fonts and print types or digital manipulation of megapixels in nanoseconds. It was my first lesson in lenses and mirrors and I got a kick out of having to put the image in upside down in order to get an image projected right side up. Years ago, when my first child was a baby, I saw one by mail order. The box hadn’t changed much. I think I found it in the back of Southern Living, but I’m not certain. I got a lot of years of sporadic, but appreciative use from the thing and my daughter had been the last one to use it. That’s three generations of Magnajector users if you didn’t notice. When you loose your stuff, the Magnajector is the kind of a thing that feels like a splinter. Loosing it delivers the maximum amount of annoyance that something can without truly being serious. I didn’t use it often, in fact rarely, but when I wanted to take a pattern from a costuming book and blow it up on the wall to trace it full size on paper, this simple, inexpensive, old technology is so much faster than the instructions in the book for increasing the size and it allows you to adjust experimentally on the wall, rather than repeatedly on paper or fabric. It’s so much less expensive than taking it to a print shop with a plotter. Sometimes having the right tool, even if it is simple and dated, makes all the difference in how a project turns out, how long it takes and even whether or not the project is tackled in the first place. So, today in the thrift store I found it, sitting on its side in a pile of other things, no box, no markings, unrecognized and unappreciated by anyone else, another Magnajector in shining, like new condition. It appeared to be unused, and for the bargain price of a measly $5 it was mine. If I ever find one in Bakelite, that would be really cool, but for now I’m totally happy and the difference between the price I paid and the $30-60 I would have paid to get it elsewhere does three things. It makes me feel good about replacing something I seldom use, it helps make up for all of the gas and time I spend while hunting treasure and it recycles well functioning tools. All I had to do to get it was to keep having the faith that if I showed up and searched, good things would happen. I’m feeling really down today. It’s been a tough week. A real estate agent called and asked me to re-make an offer that I made back when her listing was new. I had an appointment to view the property to see if the condition had changed. I was all set to write the offer, close quickly, have the home search behind me and dig into the hefty renovations ahead. The agent called as I was heading out the door and told me that the seller had cancelled the appointment and raised her expectations. This was the second time I had let myself become invested in that particular home, only to have my hopes dashed, this time it was at the last minute. I felt like Charlie Brown when Lucy yanks the football away and he falls flat on his back. I threw myself into looking anew and even made an appointment to see another home in the afternoon. I’ve stayed up till the wee hours trying to figure out what to do. Because I need a certain size, a certain location and have a fixed budget, I’m looking at a lot of homes that need work. That’s fine. I’d rather work on a bargain and make it my own castle with that little increase in equity that everyone wants as a reward for the hard work. The problem is that there aren’t any bargains. Sellers are hanging on and flippers are snapping up the foreclosures and doing shameful rehabs. You know, it just doesn’t take much time or money to take a few screws and secure the floor before you lay that $10/square yard contractor grade carpet and call it golden. I see so many disrespectful “rehab” choices that had to have been made with contempt that it makes me want to scream. Bad work doesn’t increase value, but it does increase the price. So I’m going to talk about last weekend instead. Last weekend was great. We went for a drive to pick up a dresser being given away by someone on Craigslist. When I saw the photo, I thought we might keep it, but when we got there… Well, it was a good solid dresser, but photos can be very deceiving. I think this dresser will end up in the booth because the feet that didn’t show up in the photo totally changed the look and period. It’s a good dresser, but not my style (Russ was a little disappointed to hear this) and there were no matching pieces either. I’d like my bedroom to match. Before it had two full and separate sets with extra pieces. I think some downsizing may be in order here. We loaded the dresser and took off, ready to yard sale home. The first sale had a couple of antique sewing machines. I didn’t intend to buy these. I had been given quite a few sewing machines before the fire because I teach. No treadles though. I’ve wanted a working treadle machine for a while. There’s just a touch of old fashioned comfort and maybe a little bit of prepper independence in knowing you don’t actually need electricity, but the cabinet on this one wasn’t the pretty Victorian style that most people think of. It was also delaminating and the home of a dirt dauber nest. It wasn’t time to buy something like that either. My stuff level is becoming unmanageable for my situation. I really only asked the price in curiosity, but the preservationist in me came out and made the purchase when a neighbor told her to scrap the machines. These machines did have some accessories that many thrift stores separate and sell off in parts. Once these things get separated, it is practically impossible to ever get a full compliment. That adds a lot to the value for anyone with even slightly functional interests. When people buy old machines, some are buying a tool or a part, some are buying a lamp base and some are buying craft parts for a steampunk project. For me it always has to go to the highest and best use, preserving functionality if there is any or supplying a part to restore usability to another machine comes first. Craft and art projects come last. As I was leaving the seller asked me if I had been to the estate sale nearby and gave me directions. The estate sale was our jackpot for the weekend. There had been a seamstress in that house as well. 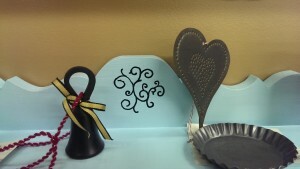 I picked up a box and saw some magnetic pincushions and scissors. Magnetic pincusions are da bomb. No spilled pins, ever, and if you ever drop one, just wave the pin cushion over it and the pin jumps for the powerful attraction. When it’s time to dust the serger fuzz from your work space you just hold the whole thing under a faucet and the dust goes while the pins stay. I asked what she wanted for the box and she said $5. I saw enough things I wanted for that price that I didn’t look at it too carefully, I just said yes. There were another three boxes on the garage floor. She wanted another five for those combined. Russ said I couldn’t buy anything else. I laughed. He said “No, literally, it won’t fit”. The boxes were small, but we hadn’t started our day with an empty truck. He was both serious and correct. Sometimes I’ll negotiate, but I clearly saw the value in the boxes, and when I started going through them at home, I’d have been embarrassed if I had asked for a lower price. There was an assortment of tools and supplies. The kind of thing that every seamstress has on hand, but they cost a lot to accumulate. I tossed out some things, but kept others. There was a tin of presser feet, those accessories that get separated, never again to be reunited with the mother ship. Who ever bought the sewing machine that was no longer at the estate sale would have loved to have them, and the kindred spirit in me would just hand them over if the opportunity had been possible. There were more scissors than I have ever owned. Good sharp dressmaker shears, cheep paper scissors, quality pinking shears and some that were too dull for fabric. I can use them for paper. I’ve never had a pair of pinks that I would use on paper because it dulls the blades. This is the kind of assortment that is most useful to someone in my situation. Normally a person only needs one or two pairs of scissors because they already have some, but I can use the whole assortment. I bought sewing machine oil to use liberally in all the spots it might be needed, from scissor hinges to machine parts. It took me several hours to separate the treasure, clean, sort and dispose. All the small parts take time and I clean it all thoroughly. I’m still not quite finished and a new weekend is here already. You know what I love? Old fashioned pipe cleaners for crafts. The kind they don’t make any more, fuzzy and thick, the ones that hold their shape with a heavier gauge wire than modern pipe cleaners have. You have no idea how excited I can get over a dozen good pipe cleaners. Having them in a drawer waiting to be used represents the kind of opportunity that filled my house before the fire and will fill my home once again in time. For the furniture, we had to invent new ways to stack and store, and we’ll need to be in a house before we can actually restore the machines and find out if they can be made to work. I bought another large piece of furniture on Monday, a beautiful teak Danish piece advertised as a “china cabinet”, but I’m planning on having it in the study (assuming that we have a study in our next home). It’s more of a credenza with bookcase than china cabinet. It has to be refinished and those wonderful guys who loaded it left it with some damage that wasn’t there when I made the decision to buy. Three days of purchases completely consumed all of the space we freed when we got creative stacking stuff. And so now I’m full circle, finished with all the positive stuff and thinking again how much I’m ready for a home ’cause it doesn’t do much good to accumulate opportunities if you can’t restore, reach or even find them. The problem with this rebuilding plan of mine is that rebuilding a life in thrift stores and estate sales is so hard to plan. You have to buy things when you get the chance and find a way to keep them without loosing your sanity until you have a place to put them.